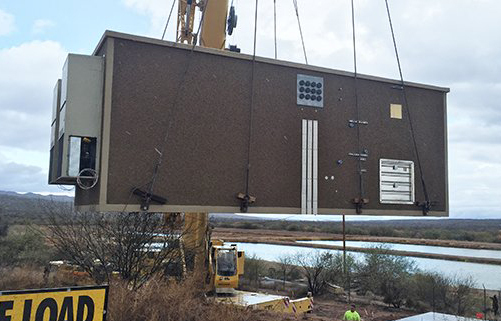 Oldcastle Infrastructure Chandler, Arizona manufactured and fully outfitted the 12‐foot by 26‐foot precast concrete, custom communications building for Motorola which houses a communications and generator room. Communications equipment is sensitive and expensive. Precast concrete buildings are ideal for communications shelters as they are highly customizable to meet the exact specifications. The buildings are customized with cable racks, trays, electrical systems, static grounding wires and more. The precast concrete communications building arrived on‐site as a complete structure that was fully‐outfitted and ready to use in a few hours. The entire production process took place in a climate‐controlled facility, which eases the need for cumbersome site equipment and staging areas and with in‐house quality control inspections there are fewer unexpected on‐site complications during the construction process.